Lifetime warranty! No hassle replacement by KRIEGER! Get uncompromised performance with RCA connections to DVDs, VCRs and audio devices using this RCA Y Adapter. Y-splitter cable connects a mono device to stereo receiver and duplicates analog audio signal. For use with your audio components, including in-home theatre system, DVD/VCR and MP3 players. The wireless Leviton DZR15 is a Z-Wave enabled 15A tamper resistant receptacle designed for use for most residential lighting and motor applications. A large range of load types are supported including incandescent, halogen and magnetic low voltage, electronic low voltage, fluorescent, and motor loads up to = horse power. The DZR15 is fully compatible with the Wink Hub, Samsung SmartThings, as well as all other certified Z-Wave controllers. As an extension to these hubs, Amazon Echo, Fire TV, Echo Dot, and Amazon Tap may be utilized for voice control over your DZC lighting products. Add or extend power, phone, or data lines. Wiremold Metal Raceway is the raceway of choice for heavy-duty applications including brick walls, concrete, or garages. Available in standard and high capacity to accommodate most uses. Makes running power a snap wherever you need it. 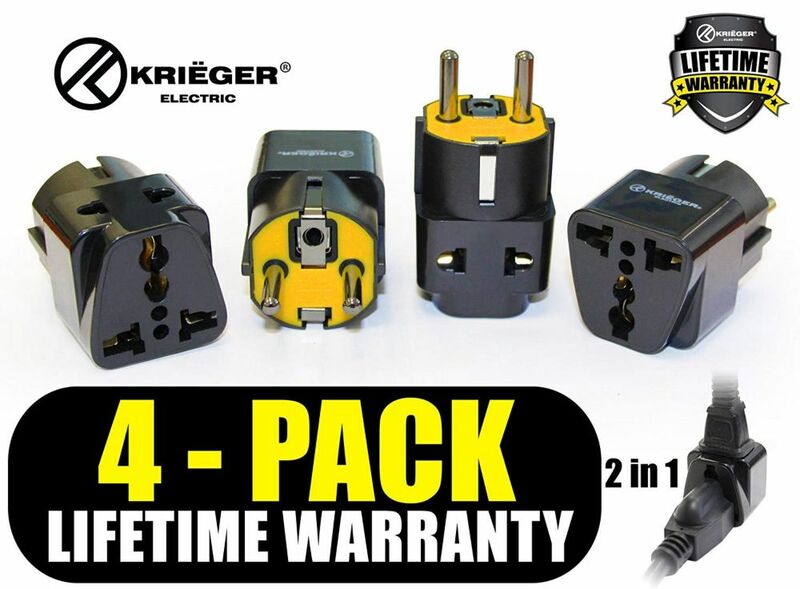 Universal to German 2-in-1 Plug Adapter (4-Pack) is rated 5.0 out of 5 by 2. Rated 5 out of 5 by Margo2018 from Worked perfectly. ... Worked perfectly. Rated 5 out of 5 by Conrad from The plug adapter worked great. We took a trip to the Netherlands and Belgium and used the adapte... The plug adapter worked great. We took a trip to the Netherlands and Belgium and used the adapters almost daily. We had a hair dryer that we purchased in New Zealand (they have a different prong set up than the US or Europe) and it worked well with this adapter. Also our US appliances worked well with this adapter. The 4 pack was nice and allowed us to charge multiple items at the same time.